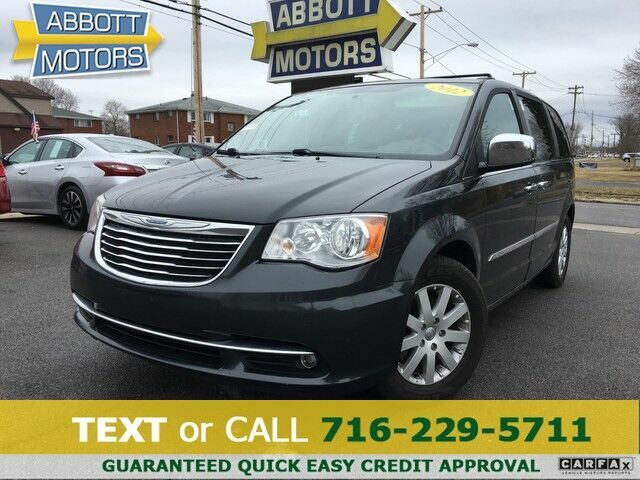 ABBOTT MOTORS, An exceptional car buying Experience, is offering this exceptional Dark Charcoal Pearl 2012 Chrysler Town & Country Touring-L w/Heated Leather, Navigation, for sale. ABBOTT MOTORS has over 50 years of automotive experience! We are also a CARFAX Advantage Dealer. We offer great deals and specialize in FINANCING FOR EVERYONE-ALL CREDIT APPS ACCEPTED! We look forward to helping you purchase your next vehicle. CALL or TEXT (716) 229-5711 for quick answers to your questions about this vehicle. Your message will be answered by a real human never an automated system This Chrysler includes: SUPER CONSOLE ENTERTAINMENT GROUP Entertainment System 17" X 6.5" POLISHED ALUMINUM PAINTED WHEELS Aluminum Wheels PWR SUNROOF Generic Sun/Moonroof Sun/Moonroof MOPAR UCONNECT WEB UCONNECT 730N Navigation System CD Player Back-Up Camera AM/FM Stereo Satellite Radio Bluetooth Connection Auxiliary Audio Input Hard Disk Drive Media Storage MP3 Player PWR ADJUSTABLE PEDALS Adjustable Pedals This vehicle is loaded with great features, plus it comes with the CARFAX BuyBack Guarantee. It's not a misprint. And the odometer isn't broken. This is a very low mileage Chrysler Town & Country. A rare find these days. If you're in the market for an incredible Chrysler featuring an Entertainment package that will surely keep your passengers enthralled, then you'll definitely want to check out the Chrysler Town & Country Touring-L. Intricately stitched heated leather and ergonomic design seats are among the details in which test drivers say that Chrysler Town & Country is in a league of its own Take the guesswork out of where you are going with the top-tier navigation system found on this exceptional Chrysler Town & Country. The interior of this Chrysler Town & Country Touring-L w/Heated Leather has been through meticulous inspection and could almost pass for a brand new vehicle. Some vehicles are more of a need-to-have. This one is a absolutely-must-have. If it's looks aren't enough to persuade you, the feel of the powerhouse under the hood most definitely will. Treat yourself to a Chrysler Town & Country that's got it all. Nearly every option is packed into this beautiful ride. With new tires, this vehicle is ready for miles and miles of driving. This Chrysler Town & Country Touring-L w/Heated Leather has a showroom quality finish with no dents or scratches visible. This rare vehicle is a prime example of automotive engineering perfected. The upgraded wheels on this Chrysler Town & Country offer an improved ride and an attractive accent to the vehicle. More information about the 2012 Chrysler Town & Country: The Town and Country's 283 horsepower Pentastar V6, which includes a driver-selectable 'Fuel Economizer' mode is mated to a 6-speed transmission and uses premium low rolling-resistance tires to deliver an estimated 17 mpg city and 25 mpg highway. An impressive luxury-style interior and optional UConnect technology brings the latest in voice-activated multimedia connections, navigation and entertainment to Chrysler's premium minivan. Strengths of this model include Powerful engine, electronic entertainment with dual DVD systems, impressive airbag array and safety engineering, advanced technologies with navigation., and luxury interior appointments STOP IN TODAY or Apply Online 24/7 at Abbottmotors.com ... All Trade-ins Welcome... Same Day Delivery... Call or Text Today and See The Difference... We Look Forward to Serving You! !This vehicle may be subject to potential open recall(s). Vehicle recall information may be found at Safecar.gov. Please verify price, equipment, options and features with your sales rep before your purchase. We Look Forward to Serving You. *Tax, title, plates extra. All Financing On Approved Credit. BBB accredited A+ member.